This is how we started out our day. 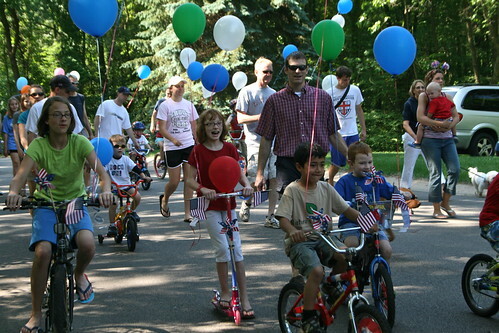 Our subdivision has a little Memorial Day parade. The kids had a blast being in the parade. It stopped at the pool where there were all kinds of activities to do. They also had a Kona Ice truck there giving out FREE shaved ice. Gotta love that. Afterwards we went to two graduation parties. For one we had to drive an hour there and back. That made for a long day but I got out of cooking dinner. The best part of this post is that you get to say "our subdivision"!!!! Congrats, again! More house pictures, please!